As people get into relationships, it is inevitable for them to share the same bed at night. While this is generally a welcome idea since it fosters intimacy and a deeper relationship with your partner, it can also bring about some challenges especially when one of you has sleep apnea. Snoring is the major symptom of sleep apnea but bear in mind that not all snorers have sleep apnea. To make that distinction, consult your doctor or a sleep specialist to get a definite diagnosis so that you can also receive the right treatment for your condition. Snoring is not only a medical dilemma, but it has likewise causes conflicts in relationships. If the man snores loudly in his sleep, the woman won’t be able to sleep at all and it can result in a bad mood and cold shoulders the following day. If this goes on for a long time, imagine how upset the non-snoring partner is having to endure chronic sleeplessness every single day. It is no wonder that some couples actually have separate sleeping arrangements in order to save their marriage. The separation can take its toll on their relationship but it is a risk they are willing to take rather than constantly suffer from sleep deprivation. 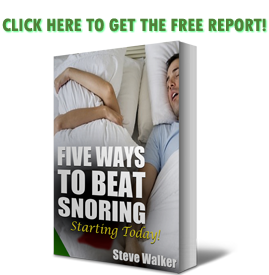 Sleeping with a snorer can be extremely frustrating. Lack of proper sleep can lead to a wide variety of health problems, including high blood pressure, diabetes, heart problems, impaired judgement, anxiety, and depression. There are many products and tips that claim to help reduce snoring, such as a snoring mouthpiece, a pillow to encourage side sleeping, or sewing a tennis ball to the back of a sleep shirt to encourage side sleeping. As the partner of a snorer, how can you be supportive of the snorer in a way that encourages them to take control of their snoring and health without alienating or upsetting them? It’s a tall order, but not impossible. Here are some tips. The simplest way to support your snoring partner is to tune out their snoring so you can get some sleep. Ear plugs can muffle snoring to a level that allows you to sleep. If you have a loud alarm and don’t need to listen for the sounds of children, beeswax earplugs do a great job of reducing background noise to help you sleep. Simply ignoring your partner’s snoring is not enough since their health is still at risk and they will continue to have poor sleep quality and it can take its toll on their health over time. Aside from providing support to their snoring partner, the one who does not snore should encourage them to see a doctor and get treated because that’s only when they will be able to experience some relief from the risks associated with sleep apnea. That’s the best way you can help your partner aside from encouraging them to lead a more active and healthier lifestyle. When couples love each other but dread bedtime together, a “sleep divorce” may be the solution. Snoring, body heat, restless legs, different schedules and a yearning for personal space are just some of the reasons why some happy couples choose to sleep apart, whether in separate beds in the same room, or in separate rooms all together. A survey of 3,000 Americans posted on a mattress review site and receiving attention recently found about 31 percent of respondents would like a “sleep divorce” in their relationship. That’s consistent with a National Sleep Foundation survey that reported almost one in four American couples sleep in separate bedrooms or beds. If needed, record them snoring at night so they can hear themselves. You can also let your doctor listen to it so they have an idea of how bad the condition is. Most of the time, you’ll actually have to undergo a sleep test requiring you to sleep in a facility to get tested while you sleep and it can provide the best data for your treatment. Let them feel that you are on their side and you are genuinely concerned about their well-being rather than attacking them for their flaws because it is not all their fault that they snore. Regardless of your frustrations, offer help and be understanding of the struggles of your snoring partner. Sleep apnea mouthpieces like https://snoringmouthpiecereview.org/good-morning-snore-solution and https://snoringmouthpiecereview.org/snorerx can also help, so help your partner research about it and urge them to try which ones works well for them because in the management of sleep apnea, it is still a hit-or-miss test and you can only tell if an oral device is effective if you have tried it for yourself.